During World War II, US Marines demonstrated great bravery assaulting fortified islands. However, the Japanese suffered four times more deaths despite their advantage of occupying carefully prepared defenses because heavy naval gunfire pummeled the Japanese and killed most of them beforehand. In some cases, naval gunfire was so devastating that Marines only had to "mop up" the survivors, which was not an easy task, but much safer once Japanese defenses had been wrecked. Unfortunately, the US Navy lost most of its shore bombardment firepower with the retirement of the four Iowa class battleships, along with their 16-inch (406mm) guns. This was because US Navy officers think that thousands of naval rounds were fired during World War II because the guns lacked the accuracy to hit targets. They believe that expensive precision-guided munitions can destroy targets at a lower cost. This is false, naval guns usually had no exact target, they just fired into areas occupied by a concealed enemy knowing that some rounds would hit something of value. This may seem wasteful, but each round that hit the enemy saved lives in the landing force. Such is the nature of naval gunfire and artillery support, firing large numbers of rounds to saturate a target area occupied by enemy forces. Despite the value of precision-guided munitions, B-52 carpet bombing remains the most effective method to destroy enemy ground forces in defensive positions, as evidenced by operations in Iraq, Kosovo, and Afghanistan. Heavy firepower is often the only way to destroy smaller targets even after identification. Modern GPS-guided munitions can't hit a machine gun nest, and a small bunker may require several attempts. Naval gunfire deals with this problem by firing large numbers of cheap ballistic rounds until one hits. The post-Cold war US Navy recognized the need to focus on land attack, but Admirals cannot grasp the need for shore bombardment FIREPOWER. They plan to further degrade the Navy's firepower by wasting billions of dollars on the idea of a precision guided gun round. The first attempt was the 5-inch Extended Range Guided Munition (ERGM), which became a $50,000 gun-launched missile that delivered just 19 lbs of submunitions 40 miles away using GPS satellites for accuracy. The gun launched missile was very complex and prone to failure due to the high G forces at launch. Although the ability of electronics to operate after gun launches is proven, the Navy's new Mk 45, Mod 4 5-inch gun induces 80% more mg's of stress on the projectile to give it a range of 40 miles. Tests were disappointing because the powerful charge needed to fire the ERGM overheats the barrel, and rounds fell well short of the program objective of 63 miles. Over $600 million dollars were wasted on this program until it was cancelled in 2008..
1. Assuming the barrel heating problem was solved, it could only be fired at half the rate of current ballistic rounds because the ERGM missile requires double ramming. 2. 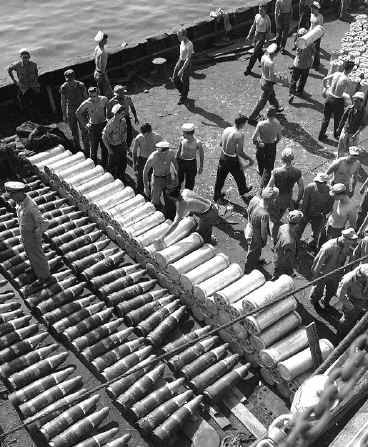 Since it was more than twice the length of ballistic rounds, fewer rounds could be carried in each ship magazine. 3. 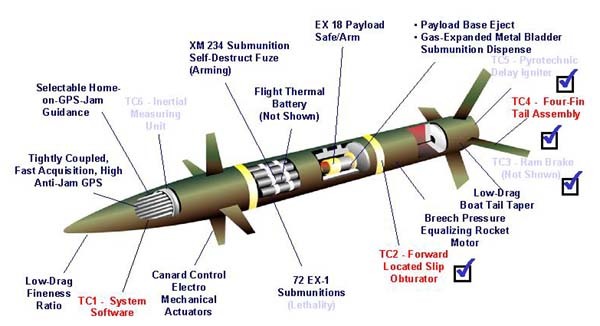 The US Army rarely uses "Copperhead" 155mm laser-guided munitions because they are considered too expensive. Each ERGM round cost $50,000 each, compared to $400 for each ballistic round. As a result, ship Captains would be reluctant to use them. In wartime, a basic fire mission is "100 rounds fire for effect", so a typical ERGM barrage would cost $5 million to deliver 1900 lbs of firepower, which is what a 16-inch battleship gun could deliver in one $400 shot. In contrast, a volley of four Tomahawk missiles can deliver 4000 lbs of firepower hundreds of miles away at the same cost! 4. Ammunition is stored for years for wartime use. Complex electronics degrade while in storage and any internal battery must somehow be replaced every few years. In addition, moving ERGMs from factories all the way to a ship gun breach overseas expose them to extreme temperatures and rough handling that may render the missile a dud. 5. The ERGM's 72 complex submunitions produced dangerous duds. The US Army estimates that 5% fail to explode on impact. If the Navy fires just 100 ERGM rounds at a target (or 7200 submuntions), advancing Marines must move through at least 360 unexploded grenades. Army studies show that 40% of these are extremely hazardous, and historically 13% of these have been accidentally detonated. This means that if only 100 ERGM rounds are fired at target before Marines advance, it will result in 19 incidents of fratricide. This also causes severe training and post-combat problems because every ERGM fired eventually requires hours of dangerous work by Explosive Ordnance Disposal teams. The Army is attempting to fix this complex problem with a backup fuse, but this will increase costs and complexity, and achieving more than 95% reliability is a daunting challenge. 6. The US military is spending millions of dollars to develop devices to overcome GPS jamming, so obviously this is a concern. This may prove impossible because jamming is mostly a factor of power and distance. The signals from solar-powered GPS satellites 12,500 miles from Earth cannot compete with ground jammers a few miles below. Even UHF television stations can jam GPS over a wide area. Contractors claim that jamming doesn't matter because the ERGMs inertial guidance will ensure accuracy, but this has yet to be proven. 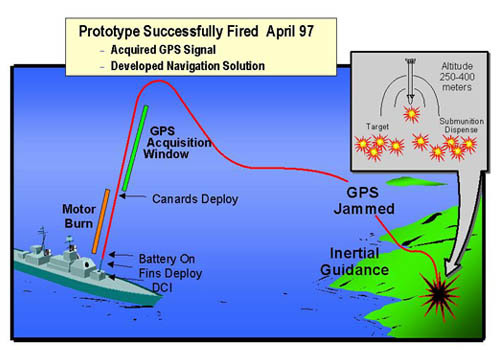 This all assumes that GPS satellites are not damaged by enemy lasers or destroyed by missiles. 7. ERGMs are fired at high angles to allow accurate GPS reception, but this hurts responsiveness. The ERGM operational requirement document specifies the need to respond within 10 minutes to a call for fire (ordnance must be on the target no later than 10 minutes after the forward observer initiates the call for fire.) At maximum range, ERGM flight time can be up to 7 minutes, leaving no more than 3 minutes to prosecute a call for fire. By contrast, the Marine Corps requirement for artillery fires responsiveness is 2.5 minutes. This means that Marines 40 miles ashore must wait at least 5 minutes for an ERGM round to impact. A charging horde infantrymen can cover half a mile in five minutes, and vehicles can move miles during that time. 8. The ERGM is inaccurate in windy conditions because it is designed to explode and release submuntions 300 meters above the surface to allow them to spread. The Navy is considering a unitary warhead to compensate and provide the ability of penetrate small bunkers. However, a 19 lb warhead doesn't seem worth the effort, which is why ERGM salesmen stick with the 72 submuntions pitch. Regular 5-inch rounds deliver a 70 lb warhead. 9. Despite the anti-armor sales pitch, the chance that a submunition will disable an armored vehicle is slight. 10. The cost of ERGMs had been estimated from $35,000 a round to $60,000, although the Navy used low-ball estimates. An expert quoted in "National Defense" magazine noted: "When it comes to cost, ERGM is no different than any other guided munitions program", said Don Kennedy, a warhead designer who worked on the ERGM project during the early stages of the program, when it was managed by Texas Instruments. He added: “Every program I’ve ever worked on starts out as ‘low-cost ammunition,’ and then it turns out to cost 10 times as much.” In 2005, the US Army purchased its first batch of 155mm ERGM rounds called "Excalibur" at a unit cost of $155,000 each. The Navy finally abandoned the 5-inch ERGM round in 2008, but then announced plans for an AGS 155mm (6.1-inch) fantasy gun must hit targets out to 100 miles. Since current 155mm guns can reach just one-third that range, physicists are waiting for this Nobel prize worthy design to be unveiled. Meanwhile, the ERGM concept continues under a new name, the Long Range Land Attack Projectile (LRLAP) using a larger 155mm projectile. These are to be mounted on the Navy new Zumwalt class destroyers. But the Navy recently deemed this class a failure due to high costs and other problems and limited its buy to three. The Navy plans on buying more DDG-51 Burke destroyers with 5-inch guns. Since the Navy recently limited the Zumwalt class to three and returned to buying Burkes with 5-inch (127mm) guns, it is unclear if the Navy will foolishly retain 155mm guns on just three ships with a training and parts pipeline along with an entire class of 155mm ammo, which is not compatible with 155mm ammo used by the Army and Marines. Just like ERGM, the LRLAP costs much more to deliver a pound of firepower than the Navy's "expensive" Tomahawk missiles. It is cheaper and more effective to buy more million dollar land-attack tactical Tomahawks than to buy LRLAPs, not to mention the billions of dollars needed to introduce a new 155mm gun to the fleet. The Navy already developed a 5-inch laser-guided munition several years ago that can hit moving targets and should purchase. If Marines operating far from shore need firepower, they can bring 120mm mortars, which deliver 29 lb munitions within a minute without the ship-to-shore communications obstacle. The 155mm fantasy gun should be cancelled, and a proven 8-inch gun mounted on future navy warships, which has the range to shoot basic ballistic projectiles from safely over-the-horizon.